That sentiment was one reason we felt it necessary to address the adaptation of the principles within The System to an older athletic population with the desire to train for performance (Scaling The System). An additional area of interest was the application of the principles describe in The System into the rehabilitation setting. In The System, we only touched briefly on the subject of injured athletes, primarily in the context of the integrated roles of rehabilitation and strength and conditioning professionals in training the “return to sport” athlete. The concepts of high-performance training are rarely included in a physical therapy curriculum. As physical therapists much of our patient care time and effort are focused on scenarios such as the reduction of pain and other noxious stimuli, the restoration of movement and eventually “function.” Even through the course of a career, the majority of continuing education courses available are focused on advanced manual therapy techniques or more esoteric approaches to reducing pain and improving mobility and function in our patients. No doubt, pain is the number one driver of poor mobility, poor movement quality and the associated disability that comes with it. However, pain is a symptom, so we have to ask, “are we dedicating excessive attention to battling symptoms vs. developing strategies to correct the root causes of the noxious stimuli and resulting disability?” Moving well and pain-free are certainly a priority, but there needs to be a better long-term strategy for preventing re-injury and/or continued dysfunction if we hope to build more resilient athletes and patients. Poll a room of PT’s about a particular injury or surgical recovery and you’re likely to encounter a wide range of approaches and progressions to treatment plans. This is certainly acceptable as “many roads lead to Rome,” so to speak. However, somewhere in the mix there are likely some who lack an extended plan for the entire course of their patients’ rehabilitation. These healthcare professionals may argue that it would be a waste of time to meticulously plan an extended program design for a patient’s course of therapy when a response to day-to-day treatment cannot be predicted. A valid statement indeed. We need to treat what is presented, and when necessary adapt the program design from the variables that may evolve to interfere in a patient’s recovery. This “adaptation” is often a moving target. However, the approach of a planned program design allows the healthcare professional to be proactive vs. reactive during the patient’s course of rehabilitation. Strength and conditioning professionals will design programs that span weeks, months and even years. These planned programs not only include exercises, exercises intensities and exercise sets and repetitions, but also dictate when to work hard, when to recover and when to provide time off for the athlete. Although circumstances will certainly arise impacting an athlete’s abilities or capacity from workout to workout, most strength and conditioning professionals address these circumstances from the adjustment of the planned program and not just to events as they arise. Where Does Rehab Meet Performance? Before every healthcare professional anticipates the suggestion of a year-long periodized rehabilitation/training protocol for every patient, please understand that’s not the message we are sending. Most clinicians do not have access to a full rehabilitation and performance enhancement team (although we would stress the importance of building an informal one). It’s very easy to segregate rehabilitation and performance training as distinctly separate entities. If access to a trusted personal trainer or strength coach for long-term physical training of a patient does not presently exist, it’s critical to understand that it now places additional emphasis on the healthcare professional to get the athlete or patient to a higher level of physical ability to safely return to the weight room, the practice field or their sport of participation without restriction. That means bringing the concepts of performance training into the rehab model. 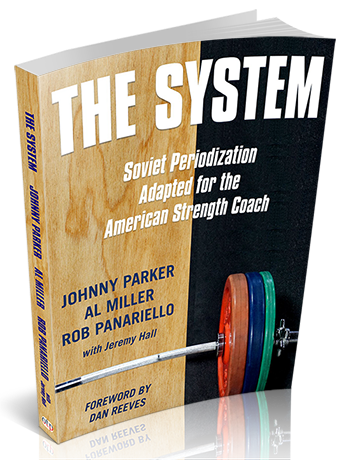 The System, more than a prescribed protocol of cycles, volumes, sets, reps and intensities, is intended to provide a framework from which organization and planning of an athlete’s program occurs along a continuum. Rehab and training are very similar entities. They exist on the same continuum of physical training; it’s just a bearing of the specific goals and interventions applied. Charlie Weingroff probably put it best in the title of his OTP video series; Rehab = Training, Training = Rehab. 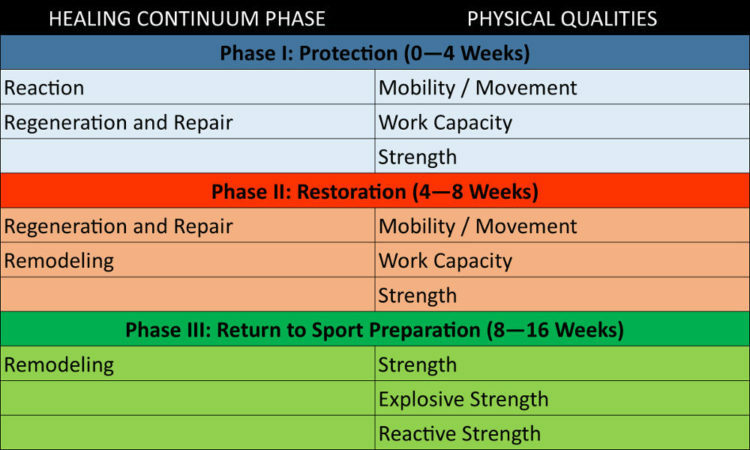 The healthcare professional tends to be very strong and focused at the beginning of the continuum and strength coaches tend to be very focused on the higher end of the continuum, but the problems that may arise often occur in that muddy, middle ground between the worlds of “rehab” and “performance“ where these professions intersect. To place this discussion in perspective, let’s review the situation faced by athletes returning to sport after ACL reconstruction. The scientific literature has revealed a less-than-optimal picture for successful return to sport after ACL surgery. A specific meta-analysis of 48 studies involving approximately 6000 patients revealed at three years post-surgery 82% of the patients had returned to some type of athletic activity, 63% returned to their pre-injury level of participation, and only 44% returned to competitive sports. This meta-analysis does not include the incidence of re-injury or contralateral knee injury to the ACL for those who did return to play their sport. Much has been dedicated to the root causes of ACL injury and the importance of hip internal/external rotation range of motion and strengthening. Awareness has also been made to motor control interventions and other novel solutions. There is no shortage of applications of physical quality and neuromuscular interventions for ACL prevention in particular, however, the progressive planning and application of these programming solutions are also integral in the “preventative” and “return to play” cause. The model proposed in The System is not novel, but it is logical, practical and progressive. 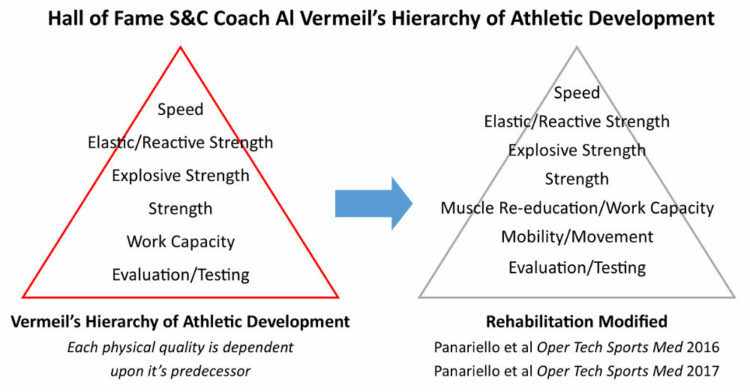 Constructed from Hall of Famer Al Vermeil’s Hierarchy of Athletic Development, it could also be thought of as the Hierarchy of Physical Development when applied to the rehabilitation setting. One cannot achieve the optimal development of a physical quality without the optimal development of its physical quality predecessor. Over the course of recovery, the bulk of the work performed by the patient should ascend up the pyramid. As mobility and movement quality improves, less time should be spent in this area and shifted toward developing the patient’s work capacity. As work capacity improves, more time should be dedicated to strength qualities, and so on and so on. In relative importance, the physical quality of strength forms the foundation of this process. Restoring an athlete’s work capacity or the ability to perform exercises repetitively over time without the onset of excessive fatigue requires the necessary joint mobility and neuromuscular control to be technically proficient via an expression of muscle activity. Power enhancement requires a basis of sufficient strength for the body to perform at high velocity. If a muscle cannot generate adequate levels of force, how can it possibly produce force quickly? Elastic abilities are precedent on the enhancement of the physical qualities of strength and power, and much of the physical quality of speed is dependent upon optimal development of elastic abilities. In many cases after the initial phases of rehab, where the focus is placed on reducing pain, edema and other noxious stimuli while improving mobility, general muscle re-education and movement quality, progress may begin to plateau for the patient. Often, simple exercises such as a bodyweight squat or a lunge start to progress in ways that do not emphasize the development of strength. 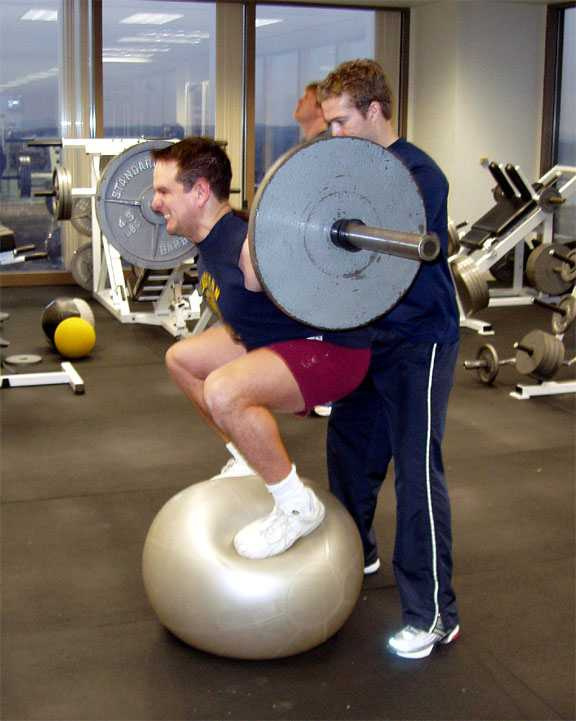 BOSU balls or other unstable surfaces augment the treatment for some well-intentioned effort to train the patient in a more “sport-specific” manner or train balance and strength simultaneously. Additional props and movements are thrown into the mix that may eventually result in more of a circus act versus the training required to result in improved on the field performance. is being emphasized with this exercise. It should be noted that the intent of physical training, whether it be in the rehabilitation and/or performance enhancement setting, is to restore and/or enhance the full expression of the physical qualities required for participation in a sport or activity. Physical training is enhancing athleticism, not skill. Training the “skill” of juggling a soccer ball, shooting a basketball or hitting a baseball is the task of the sports coach, not the physical therapist or strength coach. The PT or strength coach’s focus should be on the development of full-body mobility, work capacity and the physical qualities previously described. This will allow the athlete to succeed in more challenging movements such as jumping or running, that then facilitate sport-specific skill training and most importantly improve resilience to reduce the incidence of injury. Training is to prevent injury and improve athleticism. Practice is to improve skill. In the settings of the clinic, training room, weight room and practice field, time is an incredibly limited resource. Dedicating appropriate time and effort to essential interventions and activities will result in the largest effect from the smallest amount of time. Taking a reactive approach to treatment will likely result in greater challenges and misuse of time determining when and/or how to progress a patient. One can’t possibly plan for every scenario, especially when so many variables can negatively impact a patient’s progress, but a proactive program design strategy is better than relying solely on your intuition and skill as a practitioner in a “reactive” environment. A strategic starting point is to consider the treatment approach as related to the expected recovery timeline. This approach correlates the healing continuum of the body to the physical quality development for each stage of the continuum. This philosophy has been utilized by Rob over his years in the clinical setting and taught to healthcare professionals in both the clinical setting and through his lectures. As tissue progressively heals, additional physical qualities with a corresponding increased level of exercise volume and intensity may be tolerated as part of the patient’s treatment program. It is always the clinician’s decision as to which physical quality is prioritized as well as determining the patient’s physical abilities, as this is the “art” of the treatment program. Objective measures will assist to determine when mobility is satisfactory, or that an acceptable level of strength has been achieved, or that an athlete is safe to return to sport. It should not be assumed, due to a course of time alone, that because a patient is X weeks removed from surgery that they are ready to progress in developing the next physical quality or especially ready to return to sport. Does the patient have adequate hip, knee and ankle mobility to perform a technically sound squat? Can the patient perform a symmetrical squat, without weight shift, with good postural stability? Can they perform a body weight squat for multiple sets and repetitions without a breakdown in their squat technique? Can they maintain proper squat exercise technique with the application of a weight or increased intensity? Can they perform the squat exercise with increased velocity? Can they demonstrate progressive variations of the squat exercise i.e. front squat, split squat, etc. with proper exercise technique? Training the fundamental movements of a squat or a lunge or a press on level ground, with progressive intensities and velocities will do more to enhance the physical abilities and protect the athlete returning to competition when compared to a consistent implementation of “functional” activities. Focusing on just a 10% increase in strength training volume and intensity has been demonstrated to reduce the risk of injury in athletes by more than 4%. That’s a fair good return on investment with regard to training. Development of a consistent planned process of treatment based on sound principles and appropriate progressions, will allow implementation of all of the tools and techniques available in a thoughtful and structured way. Objective measures versus time of healing will allow for a more critical appraisal of what is working, and what isn’t. If your treatment approach is primarily reactive, or your exercise progression has been to simply instill exercises to be harder or more sport-specific without a solid rationale for their effectiveness, your patient outcomes may be less than ideal or inconsistent at best. The greatest challenge will always be recognizing that recovery from any injury is rarely, if ever, a straight line of progress. Expect it to be uneven. Expect it to be challenging. Be excited when a patient sails through without issue. Knowing when is appropriate to progress and when to regress, is not something that can be taught and prescribed . . . that is the art of rehabilitation, training and coaching. Hopefully, adapting the foundational approach of the Hierarchy outlined in The System will assist to blend the lines between rehabilitation and training as well as create the opportunity needed to continue to refine and expand both the art and science of your practice.